When BCCI Construction Company prepared to move its San Francisco headquarters to a new office across town, it also sought a new AV setup with expanded functionality for the space. To accomplish this goal, BCCI opted for an IP-based AV system after weighing more traditional options. BCCI Construction Company opted for an IP-based AV system for its new office in San Francisco. “We settled on the IP-based AV system mainly because it gives us the best flexibility as far as being able to route content across our eight conference rooms,” said Ken Chua, IT director for BCCI Construction Company. BCCI also liked the fact that the approach could take advantage of the company’s existing IP-based backbone. “We were attracted to the fact that it can just piggyback over our existing ethernet cable plant and infrastructure, including the switches and all that stuff,” Chua said. Joey D’Angelo designed the project while he was a vice president at Charles M. Salter Associates (he now works as director of systems solutions for QSC). D’Angelo got the idea from a previous install using a networked setup that he’d worked on for Juniper Networks featuring nearly 350 conference rooms. With the BCCI installation, the need for separate individual control processors for each instance of AV was eliminated through the use of Utelogy’s software-based control platform. According to Frank Pellkofer, Utelogy co-founder and CEO, Utelogy has participated in numerous centralized AV-over-IT projects in the higher education space, but this was its first in a corporate environment. By eliminating the need for a separate set of infrastructure, the system also provided cost advantages. “I think that it was probably 30 to 50 percent cheaper than doing AV the traditional way,” D’Angelo said. The server room features QSC products that include a Q-SYS Integrated Core, a Q-SYS I/O frame, and a Q-SYS CX204V 70-volt power amplifier. From the server room, which also has Apple TV and a Comcast cable box, the IT team can deliver content to various conference rooms directly—something that wasn’t possible in the old office without running cable to those rooms. Seven of the conference rooms, as well as the kitchen area, feature LG 55SE3B 55-inch class LED displays, while the main conference room features an NEC PA521U projector and an electrically controlled widescreen. SVSi N1211 video-over-IP decoders were installed in each conference room, along with SVSi N1111 video-over-IP encoders in the main conference room and kitchen/pantry area. 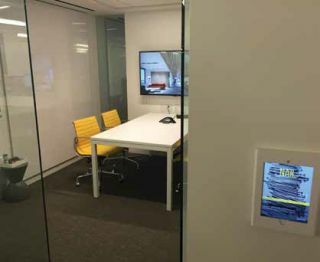 An iPad Air outfitted with the Utelogy software is bolted to the wall in each conference room. From the iPad, users can start up, shut down, and control the equipment. Seven of the conference rooms, as well as the kitchen area, feature LG 55SE3B 55-inch class LED displays, while the main conference room features an NEC PA521U projector and an electrically controlled widescreen. The new system also allows for much easier guest access to the displays for presenting via plug-andplay HDMI cables in each conference room. The system’s expanded functionality has allowed BCCI to do things like hold large town hall meetings in the main conference room as some employees virtually attend in the other conference rooms. “Both audio and video content can be routed to these smaller conference rooms, so people don’t have to cram into the large conference room, but can still participate in the meeting,” Chua said.